This blog will focus on the risks associated with regular low-dose aspirin consumption and natural alternatives. So to learn more about natural alternatives to aspirin, keep reading! Before we get into the knitty-gritty of aspirin and its alternatives, let’s get a little background info on the history of aspirin. Natural forms of salicylic acid, the active ingredient in modern-day aspirin, have been used for thousands of years. Salicylic acid is most commonly found in the leaves and bark of the willow tree, and is also present in jasmine, beans, peas and clover. Willow bark has been used at least as far back as the ancient Egyptians, who used it as a remedy for aches and pains. Later, Hippocrates wrote about using willow bark and leaves to relieve pain and fevers. Thousands of years after Hippocrates, French pharmacist Henri Leroux isolated salicylic acid in 1829. By the end of the 19th century, Bayer pharmaceutical corporation had begun distributing acetylsalicylic acid as a powder to physicians. 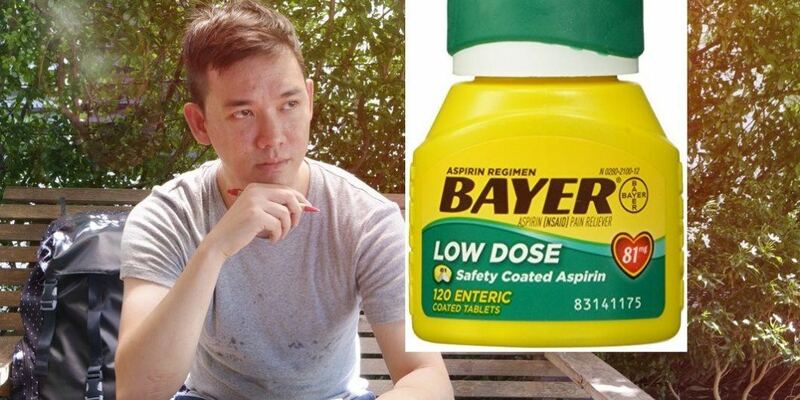 The drug was a hit, and in 1915 Bayer began selling aspirin as over-the-counter tablets (1). Today aspirin is no longer used as widely for pain and fever, as more people now reach for acetomenophin (Tylenol), ibuprofen (Advil) and naproxen (Aleve). But in the 1990s, aspirin found a new use as a preventative treatment for heart attack and stroke prevention. But because of the risks associated with even low-dose aspirin, today this preventative measure is only recommended in certain scenarios when directed by a physician (2). Fortunately, several natural substances confer similar, and sometimes superior protective effects without the risks associated with aspirin! Even relatively short-term daily use of aspirin has been demonstrated to result in negative side effects. One 2009 study administered either low-dose aspirin or a placebo daily for 14 days to a group of healthy volunteers and found that 80% of the aspirin group developed small bowel pathology, compared to 20% in the control. The authors specify that the difference between the two groups was not significant but conclude that low-dose aspirin was associated with mild inflammation of the small intestine (3). Fortunately, several natural alternatives are readily available that provide comparable, and in some cases superior cardiovascular protection, without the risks associated with aspirin. Most of these substances work by reducing platelet aggregation, or the clumping together of platelets in blood to form a blood clot. Platelet aggregation can lead to stroke, infarction, or other cardiovascular event and is of particular concern in individuals with atherosclerosis. When atherosclerotic plaque narrows blood vessels, platelet aggregation becomes a larger concern, as narrow blood vessels can more easily become blocked by aggregated platelets. In the following sections we will present research about specific natural substances that have been demonstrated to reduce risk of cardiovascular events by reducing platelet aggregation and supporting the vascular endothelium. Pycnogenol is a standardized extract of maritime French pine bark that has antioxidative and antiinflammatory effects. It is high in phenolic acids, catechin and taxifolin (4). It is hard to spell but quite effective at reducing cardiovascular risk factors. One study assessed the effects of Pycnogenol and aspirin on platelet function in cigarette smokers, who are at increased risk of cardiovascular disease and hypertension. There were somewhat conflicting results on study groups that used lower doses of Pycnogenol (100-150mg), with some groups demonstrating reduced platelet aggregation and other not at this dose. But high-dose (200mg) Pycnogenol significantly reduced platelet aggregation, compared to subjects taking 100mg or 150mg. Impressively, a single dose of 200mg of Pycnogenol remained effective at preventing smoking-induced platelet aggregation for six days! Some other study groups showed benefit from either 100-125mg Pycnogenol or 500mg aspirin, when taken after smoking. Although aspirin conferred a similar benefit, one clear benefit of Pycnogenol was that aspirin significantly increased bleeding time, whereas Pycnogenol did not. This observation led the researchers to conclude that Pycnogenol has an advantageous risk-benefit ratio (5). Policosanol is a great natural alternative to aspirin. It is a a wax extract primarily made from sugar cane that is known for its ability to reduce blood cholesterol levels without the dangerous side-effects of statin drugs. In addition, policosanol inhibits blood clotting as effectively as aspirin, but without the dangerous side-effects. One study compared the effects of policosanol with aspirin in reducing platelet aggregation in 43 healthy volunteers and found similar benefits. In this clinical trial, policosanol reduced aggregation induced by adenosine diphosphate (ADP), epinephrine and collagen, whereas aspirin was only effective in reducing collagen- and epinephrine-induced aggregation. Aspirin was more effective at reducing collagen-induced aggregation and less effective than policosanol at reducing epinephrine-induced aggregation. Overall, researchers conclude that policosanol at 20mg/day is as effective as 100mg/day at reducing platelet aggregation (6). The omega-3 fatty acids in fish oil are also helpful in reducing platelet aggregation. A 2013 study compared the effects of aspirin monotherapy and combined fish oil and aspirin in type 2 diabetics. Researchers found that the addition of 4g of fish oil per day reduced platelet aggregation more than aspirin alone. This study also observed that the addition of fish oil to aspirin treatment further reduced NF-κB compared to aspirin alone, which may result from the ability of DHA to inhibit NF-κB related signal transduction and activation (7). Another study evaluated the effects of a much lower dose of fish oil, 640mg/day, on platelet aggregation in two group of subjects – a healthy group and a group with cardiovascular disease (CVD). Platelet aggregation was induced by ADP and adrenaline. In the healthy group, the administration of fish oil significantly reduced platelet aggregation in both models. In the CVD arm of the study, platelet aggregation was also reduced, but not as significantly. The authors suggest that higher dose fish oil may deliver more significant results in CVD patients (8). Curcumin is a primary constituent of the Ayurvedic spice turmeric, and appears to prevent platelet aggregation as well. An in vitro study found that curcumin inhibited platelet aggregation induced by arachidonate, adrenaline and collagen by modulating eicosanoids. The authors suggest that curcumin’s antiinflammatory effects may result, at least in part, from its effects on eicosanoid biosynthesis (9). Another similar study found similar results. In this research, curcumin preferentially inhibited platelet aggregation induced by platelet-activating factor (PAF) and arachidonic acid (AA). Much higher concentrations of curcumin were required to reduce platelet aggregation induced by collagen, epinephrine and ADP. In addition, curcumin inhibited A-23187-induced mobilization of intracellular Ca2+ as well as the formation of thromboxane A2 (TXA2) by platelets. In contrast, curcumin did not inhibit aggregation induced by protein kinase C (PKC) activator phorbol myrsitate acetate. These results lead the authors of the study to suggest that curcumin inhibits PAF- and AA-induced platelet aggregation by reducing TXA2 synthesis and Ca2+ signaling, and that PKC is not involved in its effects (10). In good news for chocolate lovers, the flavonoids in cocoa powder also appear to inhibit platelet aggregation. One study found that cocoa-rich dark chocolate inhibited platelet aggregation induced by collagen but not ADP in healthy volunteers (11). Another similar study evaluated the effects of dark chocolate in a group of otherwise healthy cigarette smokers. Dark chocolate significantly improved flow-mediated dilation two hours after ingestion, and the benefits lasted six hours. In addition, total antioxidant status increased significantly after dark chocolate consumption. Endothelial and platelet function both significantly improved compared to the control group. In addition, there were no changes observed in glucose or lipid markers. The authors conclude that the benefits are likely due to the antioxidant properties of cocoa flavonoids (12). It’s interesting to note that both of these studies on dark chocolate used white chocolate, which contains little to no cocoa, as a control. The first study also included a milk chocolate group, which demonstrated a small but statistically insignificant improvement. These data support the hypothesis that the cocoa flavonoids confer the observed benefits, as dark chocolate is high in cocoa, milk chocolate is significantly lower, and white chocolate has little to no cocoa. In other words, the higher the cocoa content, the more impressive the results, so it’s important to stress that patients not substitute milk or white chocolate for dark. This powerful Chinese herb also known as Salvia Miltiorrhiza is well known for its cardiovascular benefits, which we have written about previously. To learn about Dan Shen in more detail, check out our previous post. Here we’ll review the high points of how Dan Shen impacts platelet aggregation. Animal studies show that Dan Shen inhibits platelet aggregation by inhibiting calcium channel mechanisms (13) (14). In addition, the Tanshinones in Dan Shen reduce cerebral infarction and support the vascular endothelium. Tanshinone also has been shown to inhibit platelet aggregation in piglets by modifying eicosanoid mechanisms (15). Several herbs and plants are great alternatives to aspirin, which we’ll cover next. Coleus Forskohlii is an herb in the mint family that is grown in Nepal, Thailand and India. One of the primary active constituents is known as forskolin, which is a diterpene and a potent cAMP stimulator. In animal studies, forskolin has been demonstrated to reduce platelet aggregation (16), which appears to be due to its ability to activate platelet adenylate cyclase (17). Two forms of the peony plant, Paeonia Lactiflor and Paeonia Suffruticosa, both positively impact platelet aggregation and blood coagulation (18). Two paeonia constituents, paeonal and paeoniflorin have demonstrated anticoagulant (19) and antiplatelet effects (20). Furthermore, paeonia suffruticosa inhibits fibrosis and thromboxane A2 (TXA2) activation of platelets (21). Several natural substances appear to offer similar benefits to reduce the risk of blood clot, stroke and other cardiovascular events, but without the risks associated with daily aspirin consumption. These options are worth keeping in mind for patients who are concerned about their heart health but are concerned about taking low-dose aspirin every day. When we recommend supplements for reducing platelet aggregation, we look at the ones we’ve reviewed in this article and see whether there are additional reasons why certain ones of these would have additional benefits for other reasons. For example, pycnogenol (or grape seed extract, which is similar in its activity) is a strong antioxidant. If we suspect oxidative stress on top of wanting to reduce platelet aggregation, we might recommend 100-200mg pycnogenol per day. We would add to that some 80% or greater dark chocolate since that also has antioxidant activity. If, on the other hand, someone has signs of inflammation, we might instead recommend curcumin in a highly bio-available form (Theracurmin, Meriva, or BCM-95) and Peony root (especially if there is also pain). We may also use omega 3 fish oil, especially if fish intake is less than 1-2 pounds of cold-water fatty fish per day. If someone has high cholesterol, we might use policosanol 20mg twice daily and possibly also some curcumin. When blood flow is poor, we would choose Dan Shen together with pycnogenol or grape seed extract. If there is low testosterone or a goal of weight loss, we might choose Coleus Forskohlii. In many cases multiple issues are occurring simultaneously and we prefer to use a combination of some of these supplements together with nutrition, lifestyle, stress-management, and mindfulness practices. Landau, Elizabeth. “From a Tree, a ‘Miracle’ Called Aspirin.” CNN, Cable News Network, 22 Dec. 2010, www.cnn.com/2010/HEALTH/12/22/aspirin.history/index.html. “Can an Aspirin a Day Help Prevent a Heart Attack?” U S Food and Drug Administration Home Page, Office of the Commissioner, 16 Feb. 2016, www.fda.gov/ForConsumers/ConsumerUpdates/ucm390539.htm. Endo, Hiroki, et al. “Incidence of Small Bowel Injury Induced by Low-Dose Aspirin: A Crossover Study Using Capsule Endoscopy in Healthy Volunteers.” Digestion, vol. 79, no. 1, 2009, pp. 44–51., doi:10.1159/000204465. Rohdewald, Peter JÃ¶rg. “Review on Sustained Relief of Osteoarthritis Symptoms with a Proprietary Extract from Pine Bark, Pycnogenol.” Journal of Medicinal Food, 2017, doi:10.1089/jmf.2017.0015. PÃ¼tter, M., et al. “Inhibition of Smoking-Induced Platelet Aggregation by Aspirin and Pycnogenol.” Thrombosis Research, vol. 95, no. 4, 1999, pp. 155–161., doi:10.1016/s0049-3848(99)00030-4. Arruzazabala, M.l., et al. “Comparative Study Of Policosanol, Aspirin And The Combination Therapy Policosanol-Aspirin On Platelet Aggregation In Healthy Volunteers.”Pharmacological Research, vol. 36, no. 4, 1997, pp. 293–297., doi:10.1006/phrs.1997.0201. Block RC, Abdolahi A, Smith B, et al. Effects of Low-Dose Aspirin and Fish Oil on Platelet Function and NF-kappaB in Adults with Diabetes Mellitus. Prostaglandins, leukotrienes, and essential fatty acids. 2013;89(1):9-18. doi:10.1016/j.plefa.2013.03.005. Mcewen, Bradley, et al. “Effects of Omega-3 Polyunsaturated Fatty Acids on Platelet Function in Healthy Subjects and Subjects with Cardiovascular Disease.” Seminars in Thrombosis and Hemostasis, vol. 39, no. 01, 2013, pp. 025–032., doi:10.1055/s-0032-1333309. Srivastava, K.c., et al. “Curcumin, a Major Component of Food Spice Turmeric (Curcuma Longa) Inhibits Aggregation and Alters Eicosanoid Metabolism in Human Blood Platelets.”Prostaglandins, Leukotrienes and Essential Fatty Acids, vol. 52, no. 4, 1995, pp. 223–227., doi:10.1016/0952-3278(95)90040-3. Shah, Bukhtiar H, et al. “Inhibitory Effect of Curcumin, a Food Spice from Turmeric, on Platelet-Activating Factor- and Arachidonic Acid-Mediated Platelet Aggregation through Inhibition of Thromboxane Formation and Ca2 Signaling.” Biochemical Pharmacology, vol. 58, no. 7, 1999, pp. 1167–1172., doi:10.1016/s0006-2952(99)00206-3. Innes, Andrew J., et al. “Dark Chocolate Inhibits Platelet Aggregation in Healthy Volunteers.”Platelets, vol. 14, no. 5, 2003, pp. 325–327., doi:10.1080/0953710031000123681. Hermann F, Spieker LE, Ruschitzka F, et al. Dark chocolate improves endothelial and platelet function. Heart. 2006;92(1):119-120. doi:10.1136/hrt.2005.063362. Park JW1, Lee SH, Yang MK, Lee JJ, Song MJ, Ryu SY, Chung HJ, Won HS, Lee CS, Kwon SH, Yun YP, Choi WS, Shin HS. 15,16-dihydrotanshinone I, a major component from Salvia miltiorrhiza Bunge (Dansham), inhibits rabbit platelet aggregation by suppressing intracellular calcium mobilization. Arch Pharm Res. 2008 Jan;31(1):47-53. Christenson JT1, Thulesius O, Nazzal MM. The effect of forskolin on blood flow, platelet metabolism, aggregation and ATP release. Vasa. 1995;24(1):56-61. Siegl AM, Daly JW, Smith JB. Inhibition of aggregation and stimulation of cyclic AMP generation in intact human platelets by the diterpene forskolin. Mol Pharmacol 1982;21:680- 687. Koo YK1, Kim JM, Koo JY, Kang SS, Bae K, Kim YS, Chung JH, Yun-Choi HS. Platelet anti-aggregatory and blood anti-coagulant effects of compounds isolated from Paeonia lactiflora and Paeonia suffruticosa. Pharmazie. 2010 Aug;65(8):624-8. Akamanchi, K.g., et al. “Synthesis and In-Vitro Evaluation of Platelet Aggregation Inhibitory Activity of Paeonol and Its Analogues.” Pharmacy and Pharmacology Communications, vol. 5, no. 5, Jan. 1999, pp. 323–329., doi:10.1211/146080899128734910. Zhu M1, Tang Y, Duan JA, Guo J, Guo S, Su S, Shang E, Qian D, Ding A. Roles of paeoniflorin and senkyunolide I in SiWu decoction on antiplatelet and anticoagulation activities. J Sep Sci. 2010 Nov;33(21):3335-40. doi: 10.1002/jssc.201000340. RR Watson; Complementary and Alternative Therapies and the Aging Population: An Evidence-Based Approach, Academic Press April 28, 2011.